The title track from Anohni’s album gets a new visual. Anohni has shared a new visual for "Hopelessness," the title track from her debut solo album released in May. 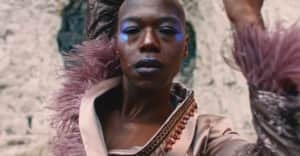 Director Alexander Carver describes the video as “medieval barbarism and fascistic architecture haunt the fever dream of an anonymous corporate woman." "I am a human, a warm-blooded creature. I love the kaleidoscopic faces of life on earth," Anohni said about the new video in a press release. "Yet my species is aggressively destroying biodiversity and poisoning the biosphere. It is hard to accept myself. I feel like I am behaving like a virus. I keep lying to myself in order to continue forward.” Watch Anohni's "Hopelessness" video above. Read Anohni At Boiling Point from The FADER.